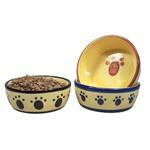 The Classic Pawprint Crock Bowls have an updated styling for the traditional Pawprint patterned bowls. 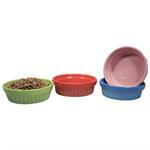 The Party Animal Crock Bowls are festive and cheerful bowls that will brighten your pet's mealtime, and brighten your kitchen, too. 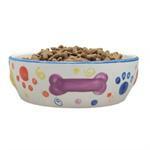 The Tuscan Fluted Crock Bowls are nice glazed bowls with the look of Italian pottery. 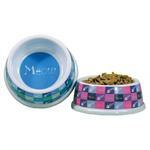 The Meow No Tip Plastic Dishes stay put while looking good. 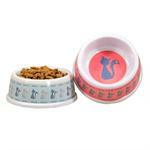 Style and stability, the Kitty Love No Tip Plastic Dishes stay put while looking good. 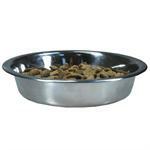 The Stainless Steel Cat and Puppy Bowl is a shallow feeding dish that is ideal for cats, kittens and puppies. Heavy-duty, polished stainless steel makes it hygienic and easy to clean.